Remote: The moment Chrome cast was released more than a year ago, Google was quick to point out that no remote control would be required – after all, the required Smartphone, tablet or Chrome browser on a desktop computer essentially already offer complete control over playback. Amazon likewise cheaper out on the remote for its Fire TV Stick, which offers only basic navigation and playback buttons and none of the voice search or game controller functionality full-sized Fire TV owners enjoy. However, Amazon is separately offering both the $29.99 Fire TV Voice Remote so happens to be fully compatible with Fire TV Stick right out of the box. For those looking to toss hardware remotes in a desk drawer and forget about them, the news is even better: All three devices can be controlled from mobile apps on iOS or Android; although at this writing Amazon’s free Fire TV Remote app is a no-show on Apple’s App Store. Roku and Amazon have other ideas about this concept, given their respective Streaming Stick and Fire TV Stick devices actually pull content from the internet only upon the command of a remote control or mobile app. That makes the Roku Streaming Stick or Fire TV Stick a better choice for viewers who prefer to hold a traditional remote in their hands, which are powered by a pair of AA batteries. Roku’s RF-based remote resembles the one that comes bundled with its current-generation set-top boxes, complete with shortcut buttons for favored nation channels M-GO, Amazon Instant Video, Netflix and Blockbuster on Demand; unfortunately, Roku skimped on the headphone jack featured on its more expensive hardware. Although Google has made great strides over the last year or so in securing the support of content providers for Chrome cast, Roku continues to dominate with more than 1,000 channels, ranging from movies to TV shows, sports, news and music. Aside from iTunes Store content – which none of these stick-based devices are capable of playing – any of these sticks are capable of streaming the most popular services, including Netflix, Hulu Plus and YouTube, although there is one noticeable exclusion on Chrome cast, which lacks Amazon Instant Video support. While Roku may cater to more eclectic tastes thanks to a diverse channel catalog, all three devices are also capable of streaming from the likes of Plex, software frequently used by home theater junkies to view content stored on their own computer or network-attached storage (NAS). That just leaves the audience with fringe services such as VUDU which is owned and controlled by Wal-Mart, which is already available on Roku and it is also very much compatible with Chrome cast, but has thus far chosen to sit on the sidelines for Amazon’s Kindle Fire, Fire TV and now Fire TV Stick. 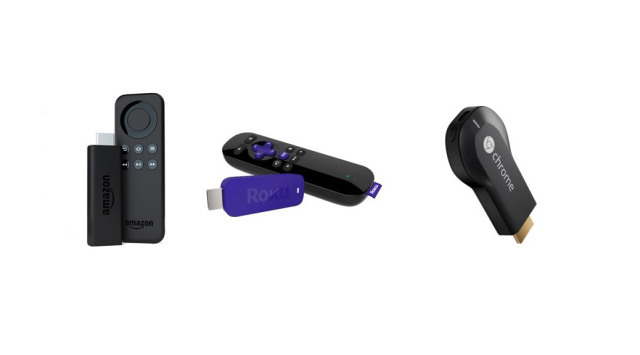 Roku has been given the apps nod here for sheer quantity and diversity of choices, but we wouldn’t count Chrome cast or Fire TV Stick out for the future, as Google and Amazon continue to line up support from other content providers.